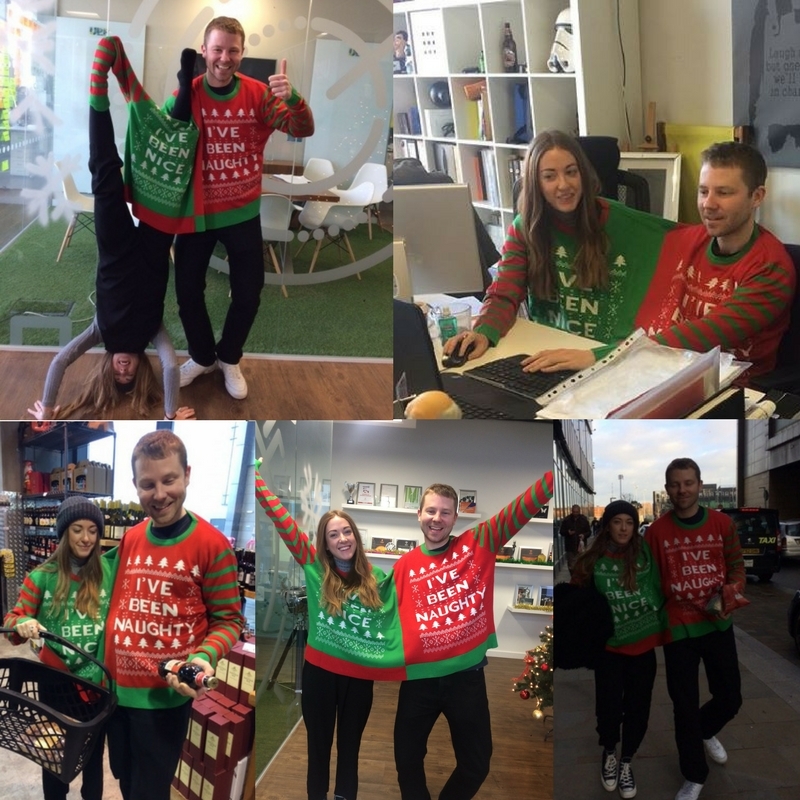 Our team at Upp B2B came together a few weeks ago to decide what we could do for Christmas. There were some great (and some incredibly brave) ideas thrown about (luckily Jasper’s idea of us all performing in an X Factor style wasn’t successful!) and we finally settled on something we thought would really show our Upp values. 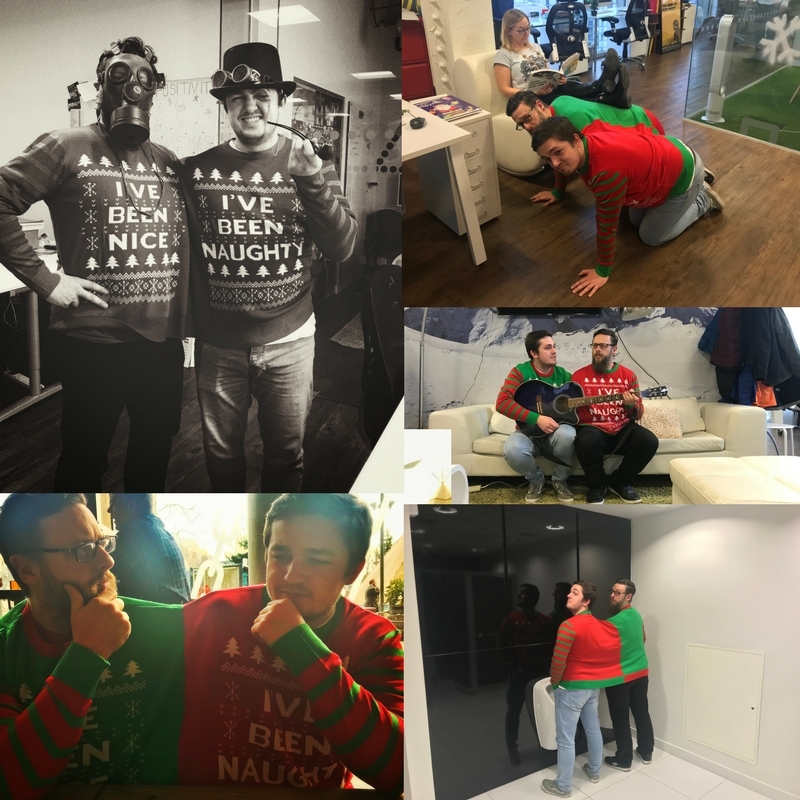 The following week, an Amazon parcel arrived, and our willing Uppers were drafted to be involved in a day of raising money by wearing a two-person Christmas jumper…or as it was to be named – the Uppmas Twumper. Taking our ‘One Upp’ value to the extremes for the day, our duos planned their activities with the aim of reaching a £1000 donation to Big Change, a charity based in Manchester that helps rough sleepers get off – and stay off – the streets. First up on Tuesday, Anthony (Creative Director) and Kai (Junior Developer). This pair set a great precedent for the duo activity. Being attached at the shoulder isn’t as easy as it looks, and these two definitely didn’t make it look easy to start with! From forward roly-poly’s to guitar playing, their fundraising efforts throughout the day were a great start to the Uppmas Twumper fun. At the end of the day, Kai said ‘it was alright, apart from when I nearly died trying to do a roly poly in the corridor. But yeah, I would partner up with Anthony again’. First day looked like a success! 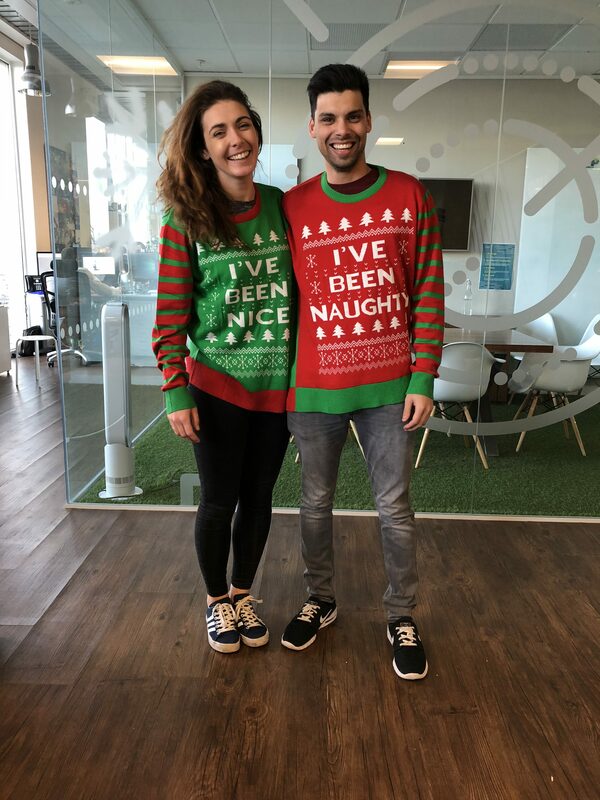 This pair were ready to rock and roll with an amazing selection of naughty and nice cakes which they travelled up and down the Blue Tower with (they didn’t make it too far before someone bought a full plate!) and spent time upside down and sharing a desk. 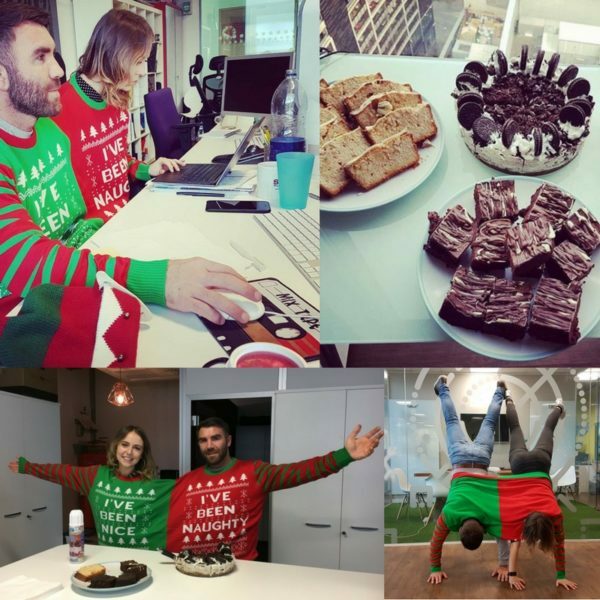 This little-and-large duo had plenty of energy to throw at the occasion, dancing and singing around the office and generally grabbing attention for our fundraising cause. These two took to MediaCityUK on a combined lunch trip around Booths and found that they had quite different tastes when deciding what to pick! 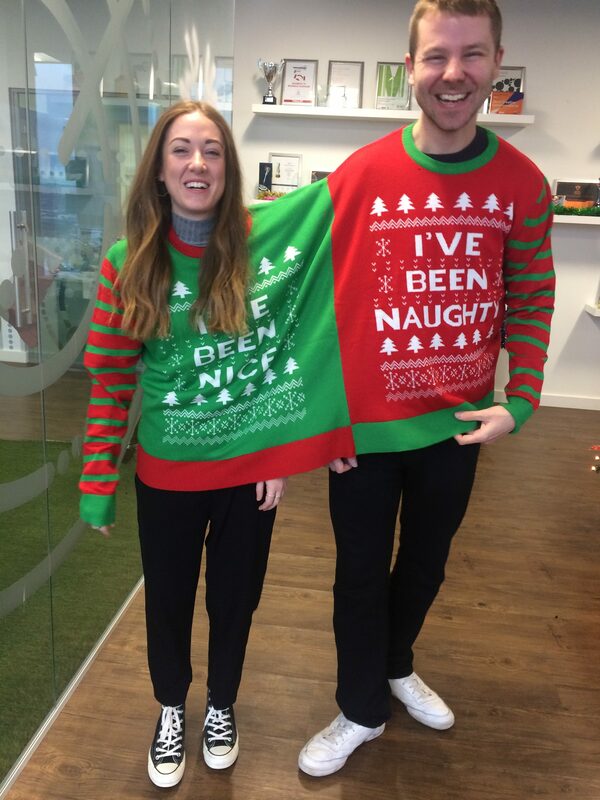 Finally, Friday came, as did the Twumper turn of Charlotte (Senior Account Executive) and Alex (Account Manager). These two (affectionately known as Chalex in the office) spend all day, every day joined at the hip. 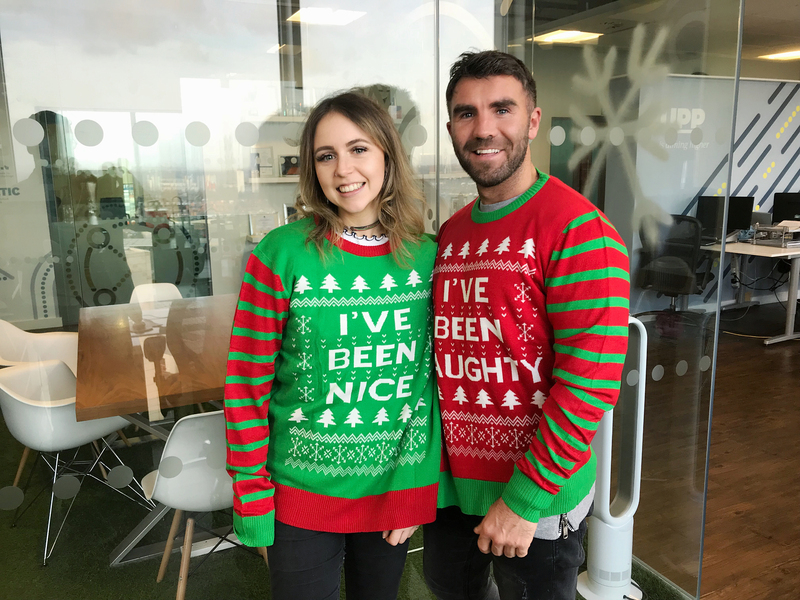 Working side-by-side and on client work, they knew it would be quite different sharing a festive jumper, and so they wanted to get as many donations as possible! 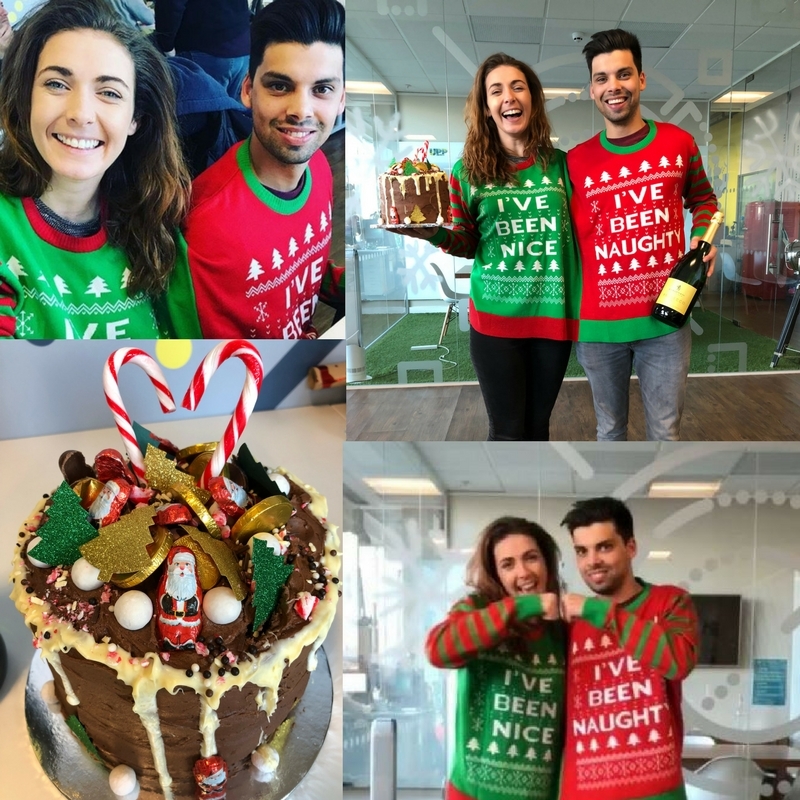 They brought to the table what every company wants on a Friday – a magnum of prosecco and a homemade Christmas cake to be raffled off to those who had donated. As the afternoon drew to an end, we reached what we had worked for the whole week – a £1000 donation to Big Change! Our JustGiving page is available to make donations to, and any change you can spare will make a difference and go towards those that need it at this time of year. Donate here. 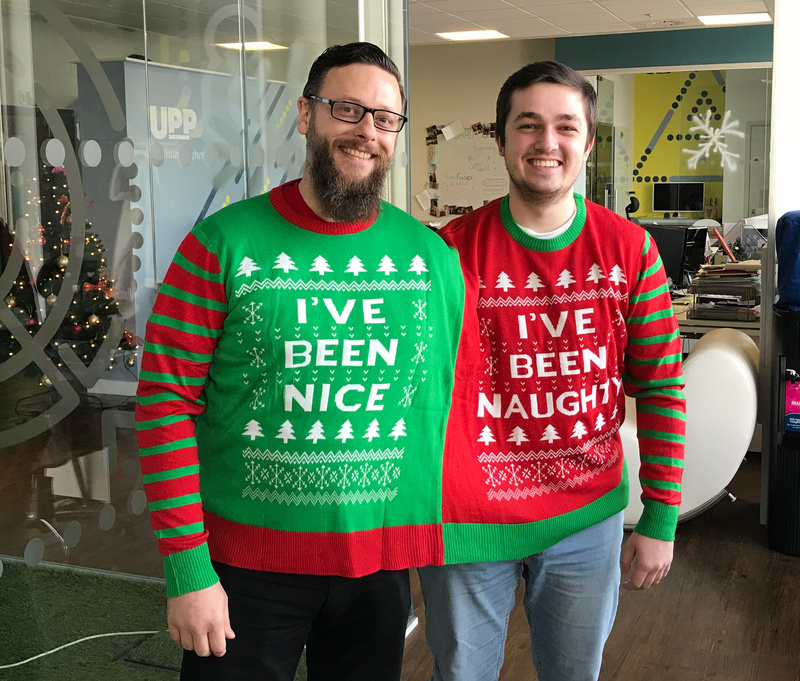 And don’t forget to keep your eye out for more Upp shenanigans in 2018 when we re-open our office on the 3rd January!